Irresistible milk chocolate bar with a melting caramel heart and hints of Himalayan salt. Appetizing, this milk chocolate bar holds a succulent heart of caramel with hints of Himalayan salt. This slightly pink crystalline salt is found in some deposits of Himalayas, especially in Pakistan. It brings a delicious and subtle salty touch to the caramel. 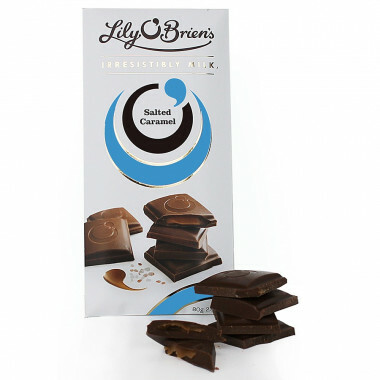 Lily O'Brien's, iconic chocolate brand in Ireland is back at le Comptoir Irlandais! In the early 1990's, Mary Ann O'Brien discovers a passion for herself in chocolate making! Full of energy, she travels the world through a tasting travel and improves her skills in the making of chocolate thanks to the training of the best chefs and chocolate makers in South Africa and Europe. She creates her company in 1992 in her kitchen in Kildare. With two saucepans, a wooden spoon and her baby Lily, she creates chocolate recipes, delicious and innovative bringing joy to her friends and family. Lily O'Brien's is an iconic brand in Ireland with its quality chocolates, it's one of the favorite brands in the country. Mary Ann still runs the business with family values, quality ingredients and creation. The primary materials come from sustainable sources. Le Comptoir Irlandais has selected 3 chocolate pouches, yummy and original, perfect for easter, a birthday or any celebration! Ingredients: milk chocolate (70%) [sugar, whole milk powder, cocoa butter, cocoa paste, emulsifier (soya lecithin), natural flavors of vanilla], caramel (29%) [sugar, glucose syrup, coconut oil, water, whole milk powder], milk chocolate [sugar, cocoa butter, cocoa paste, whole milk powder, whey powder (milk), emulsifier (soya lecithin)), butter (milk) ), salt], Himalayan salt (0.1%), natural flavour of caramel. Information on allergens: see ingredients in bold. This product may contain traces of nuts and cereals containing gluten. Contains no artificial colors or flavors. Suitable for vegetarians. Milk chocolate contains 30% minimum cocoa solids and 20% minimum milk solids.